Children are, by nature, curious creatures – especially after age six, when they have started to develop a broader understanding of the world and their place within it. Whether children were born into their families, were adopted, or just know someone touched by adoption, they will likely have many questions for their parents. As a parent, facing these questions can feel overwhelming. It can be hard to know how much information you should divulge to your child, and how to handle the burning questions about his or her birth parents. At Adoptions With Love, we understand the feeling many parents have when their school-age child begins asking more complex questions about his or her background. Gone are the infant and toddler conversations, when a simple: “You are ours and we love you!” would typically suffice. If your child is between the ages of six and 12, he or she is just now beginning to understand the greater scope of adoption and what it means. Your child may also be getting more prying questions about adoption from his or her peers at school. In this article, we will break down some of most positive ways you can talk with your child about his or her adoption story. Having these conversations now, before and in early adolescence, can invoke positive feelings about adoption in your child and help him/her create a fuller sense-of-self. First and foremost, it is important to keep all adoption conversations with your child as open, honest, and positive as possible. Your child deserves to know the truth, but this should always be framed in a positive light. Even if the truth about your child’s biological parents is difficult to share, ensure your child that they loved him/her very much and made the best possible choice they could. Always keep a calm, positive tone and show respect when talking about your child’s birth family. It is because of their choice that you came together as a family. By doing this, your child will also feel positive knowing he/she came from good people. Your child will also trust you for sharing this important information if you do so in an open and loving manner. While many children will ask questions about adoption on their own, it is important to note that others may stay silent during early adolescence. Both temperaments are normal in growing children. As a parent, try to make frequent conversations happen. If your child is not asking questions, pose some questions to your child like, “Do you think about your birth parents?” Let your child know you will not be hurt and that you are open to talking about them. Try looking for easy, organic opportunities to bring up the subject, as well. For example, if your child likes to play sports, you might say after a day on the field, “You are so talented! I wonder which of your birth parents gave you that incredible athletic ability.” This may help your quiet child feel comfortable with an open dialogue about his or her birth parents – Otherwise, your child may avoid bringing them up so as not to offend you. As long as you are happy to talk about it, they likely will be, as well. With some forethought, sitting down to chat with your child about his or her adoption story can be very beneficial and enlightening. Your child is growing up and gaining a better understanding of his or her history and background. At this age, your child may also be looking for tangible information about his or her biological family. If you have an open or semi-open adoption, consider sharing photos of his/her birth parents and what else you can about their background. Explore your child’s heritage together. Read letters from his or her birth parents. Show your child is or her birth certificate, and your proof of adoption. This will all help your child connect with you and his/her adoption story. Look at baby pictures together that you might have from the very first time you met each other. As the rule of thumb goes for any age and topic, parents should keep age-appropriate language in mind for the adoption conversation. You know your child better than anyone else in this world. If you know that he or she is not ready to learn the full context of his or her adoption story, hold off on divulging all of the difficult details until the time is right. A 12-year-old, for example, is likely to handle sensitive details better than a six-year-old who is just starting to grasp the concept of adoption. If you know that your child’s birth parents had a drug problem, for example, you might consider saving that conversation until after he/she has learned about drugs, alcohol, and their effects. As your child’s mind and relationships develop, he or she may have more complex questions about his or her birth parents. Be prepared to answer these honestly and compassionately. As always, take into consideration their sensitivity to the subject and share what you can with love. Tell your child the story with care and affection, to reassure the fact that his or her adoption story is a positive one, born out of love. Adoptions With Love is a constant resource for help. 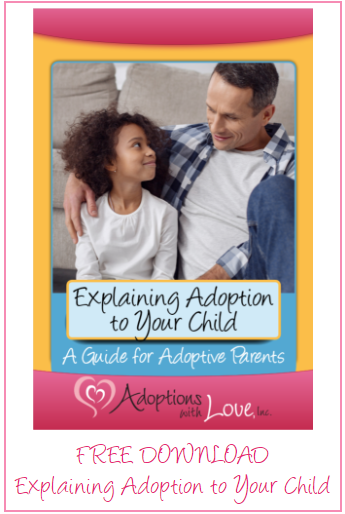 If you want to learn more about how to talk to your child about adoption, or for help on finding the right words, please download our free eBook below, “Explaining Adoption to Children: A Guide for Adoptive Parents.” You may also email us at info@awlonline.org for more information on the adoption process.